Not everyone is a fan of heights, especially when those heights involve standing on a swaying, wobbly suspension bridge. For some people, like myself, it is an amazing experience. To that end, I’ve put together a list of the 10 Washington state suspension bridge hikes that I want to do in 2019. These are all hikes that at some point have a suspension bridge worth seeing somewhere along them. 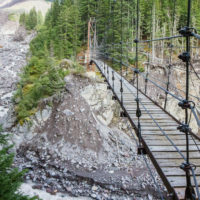 One of the more daring bridges, the Tahoma Creek bridge is at the confluence of the unmarked Tahoma Creek trail and the Wonderland Trail. The hike itself is not an easy one and this one is probably better left to more experienced hikers, especially those that can find trails when they vanish. 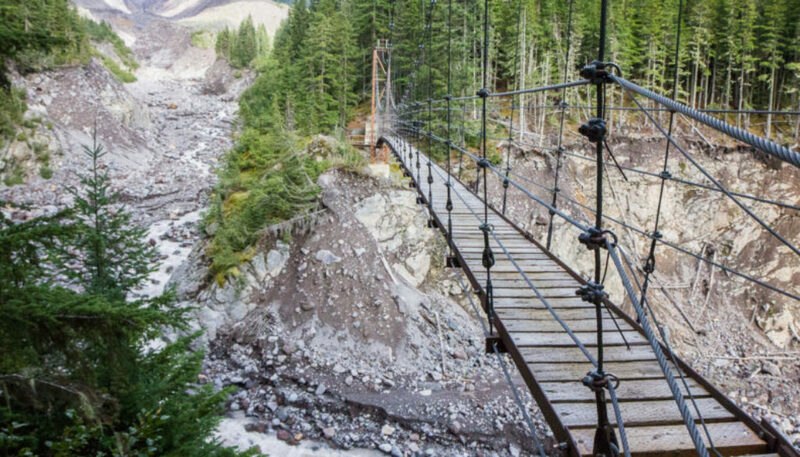 The bridge spans the ~200′ of the Tahoma Creek canyon and for obvious reasons is suggested to only hold one person at at time. 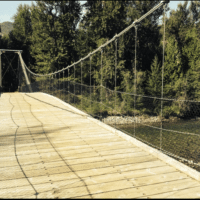 We go from the extreme to fairly sedate with the Tawlks-Foster Suspension Bridge on the Methow Community Trail. A collection of trails strung together to connect Winthrop, Mazama and Early Winters, the only difficult part about this trail is the full length. If you aren’t up for it all, the bridge itself is short of the halfway point if you come at it from the Early Winters Campground end. Next we go out to Central Washington for a trip down the Umtanum Creek Canyon. A relatively easy hike, just shy of 7 miles with very little elevation gain, this is a great Fall hike. 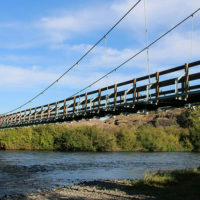 Rebuilt in 1987 in concert with the Department of Fish and Wildlife and Bureau of Land Management, this suspension bridge is the only access to the canyon on the other side of the Yakima River. This bridge serves as the access for both the Umatanum Creek Canyon trails as well as the Umatanum Ridge Crest trail. I am cheating here a bit as I’m lumping two bridges and several hikes all in to one chunk. The Ross Creek – Ross Lake recreation area though seems all like one unit to me. In it you can find the Lightning Creek and Devils Creek suspension bridges though. 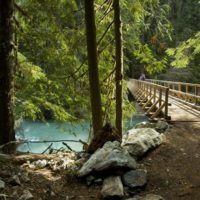 Following the Thunder Creek trail you will find what sounds like an idyllic hike. How on Earth can you pass up a trail with a description like that? Moving on to the Devil’s Creek bridge, you can find it off the East Bank Ross Lake trail giving access to Lightening Creek campground and all the areas beyond that. Be sure to check all the rules before heading out into these areas though as permits are needed for overnight stays and some hiking areas. The Diablo Lake Trail does not get a lot of love from hiking guides since power lines are visible along much of the trail and the noise pollution from the highway is ever present. That being said, this looks like a cool little bridge to check out when you want a relatively easy year-round destination. Any hike to a hot spring is a winner in my book. Add in a suspension bridge along the way and it is a double win! Now the fact that the road is washed out so it is a long ~22 miles up and back is a little bit of a bummer, but that is life I guess. Back to an easy, easy trail that I honestly wouldn’t consider a hike. At under two miles, the main attraction here are the giant trees, some reaching as high as 300′. The cute little suspension bridge to get to them is a plus though, and I will have to make this a side trip on one of my outings. The Carbon Glacier trail is the Northwest entrance to the Mount Rainier National Park. This hike gets great reviews from hikers, but it appears that currently there are some challenges with washouts along the trail. That isn’t enough to stop me from a foray into Bigfoot’s living room and a stroll across a skinny little suspension bridge. Down to the Mount St. Helens area we go to hike the ~5 miles of the Lava Canyon trail. This is an opportunity to check out a canyon cut from the mind numbingly large lava flows that once spread across most of Washington state. The trail goes from easy access to a small trail skirting the cliff, eventually leading you across our goal, the Lava Canyon Trail bridge. 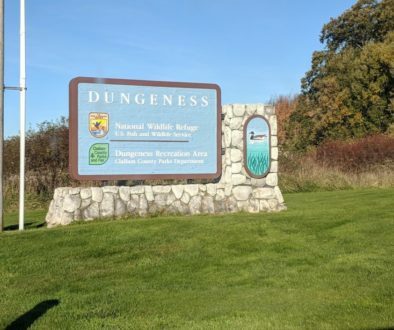 That is my list of Washington state suspension bridge hikes for 2019. I’m planning on trying to get to all of them, other adventures permitting. There were a few more that didn’t make the list. Once set of suspension bridges that are definitely worth checking out if you are the East side of the state are those at River Front park in Spokane. The massive waterfalls are spanned by a couple of very cool suspension bridges. Get there in the spring and the falls will literally be roaring! 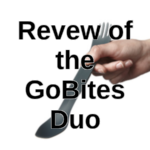 Some of the links you will find on this site lead to products or services that you can buy. If you do we make a small commission on that transaction. In addition some people give us free gear or travel in order for us to write about them.